NOTE Build 2110 has introduced automatic running. This set of pages have been rewritten. 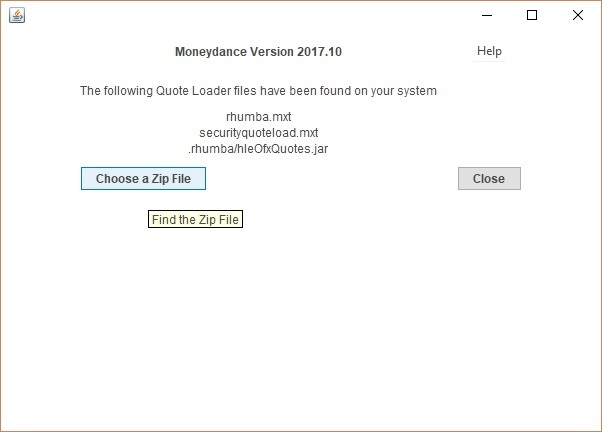 Welcome to the wiki for the Moneydance Quote Loader Extension. This extension has been built to help users overcome the issues created by the closing down of the Yahoo Finance API and the throttling of the Alpha Advantage free service. The extension is a collaboration between myself (Mike Bray), the developer of the hleofxquotes standalone program and Derek Kent. Please note: This extension uses 'screen scraping' to capture the prices, i.e it mimics a user and copies the price from the web page. The two sources, FT.com and Yahoo.com provide the prices for free as long as you are using the data for your own personal use. Should they change their policies this extension may stop working. Please do not use the data obtained from this extension for commercial gain. 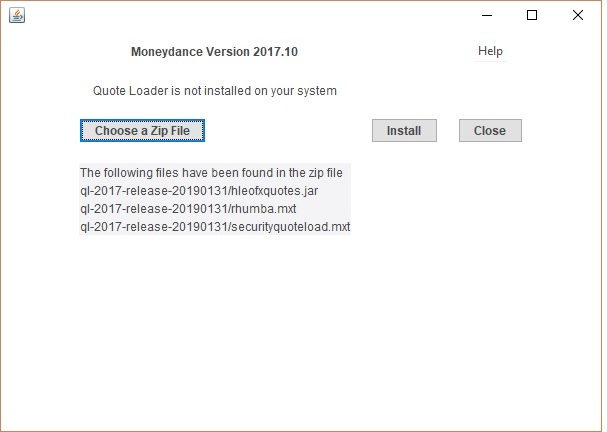 Download the files qlinstaller.mxt and QL-201x-release-yyyymmdd.zip, where 201x is either 2017 or 2019 depending on which version of Moneydance you are using and yyyymmdd is the date of the release you wish to download. Note: Moneydance will tell you that the signature of the file is either invalid or missing. This means that InfiniteKInd has not signed the extension, click on Yes. Click on Install and you should receive the message: "Files have been installed. 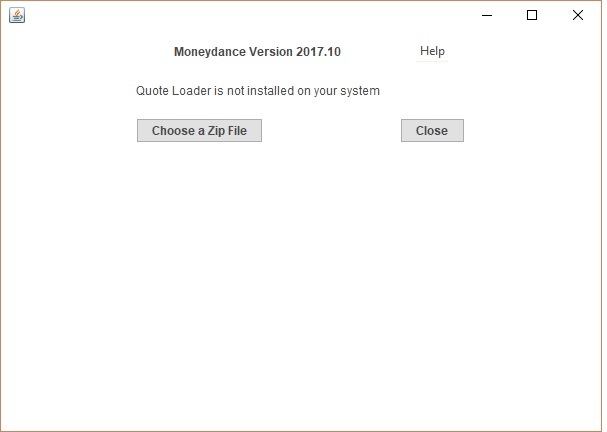 You must restart Moneydance to enable the extension"
You should be up and running. Select Quote Loader from the extensions menu. "Extension Rhumba is not present. Please install and rerun the Quote Loader"
The Rhumba.mxt is missing or has not been installed correctly. Try again. There is no guarantee that the Quote Loader system will continue to operate. Factors outside the developers' control may change and the system will be unable to return quotes. User’s should be aware of this warning and only use the free Quote Loader system based on the acceptance of this possibility. You use this extension at your own risk. I am not part of The Infinite Kind support and I am providing this extension for free. Support is on an 'As Available' basis. The extension displays all of your securities that have holdings. 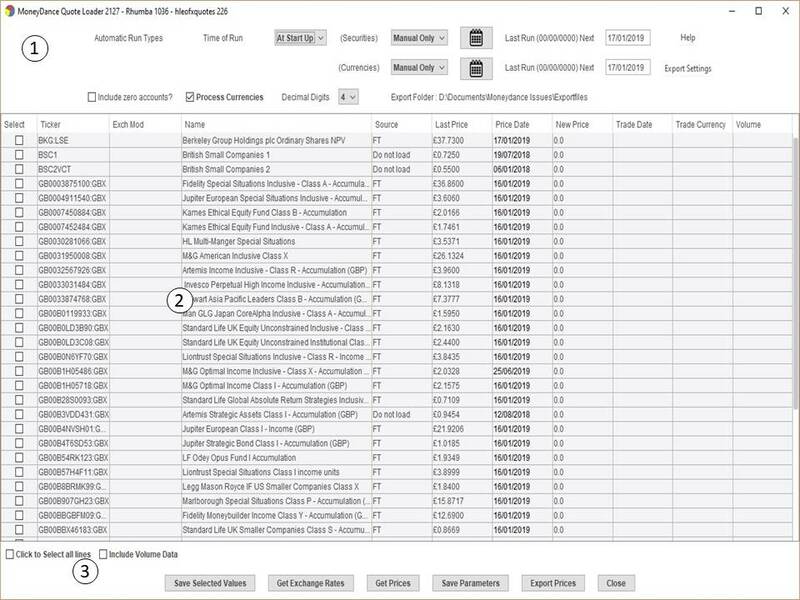 You can also choose to display securities that do not have holdings (include Zero Accounts) and/or currencies (Process Currencies). Note: Securities with no holdings and Currencies will only be displayed if they have the 'Show on Summary Page' option ticked. The extension then allows you to download the current prices for the displayed securities/currencies. To do this you need to select which source you wish to use for each line. The extension will attempt to retrieve a price for each security/currency from the selected source. You can find more information in the PDFs and video written by Derek Kent. You will find them in The download folder.